Tiger Forces, Tribal Forces Liberate Shinan Village In Southern Raqqah Countryside (Map) 4.8947368421053 out of 5 based on 19 ratings. 19 user reviews. 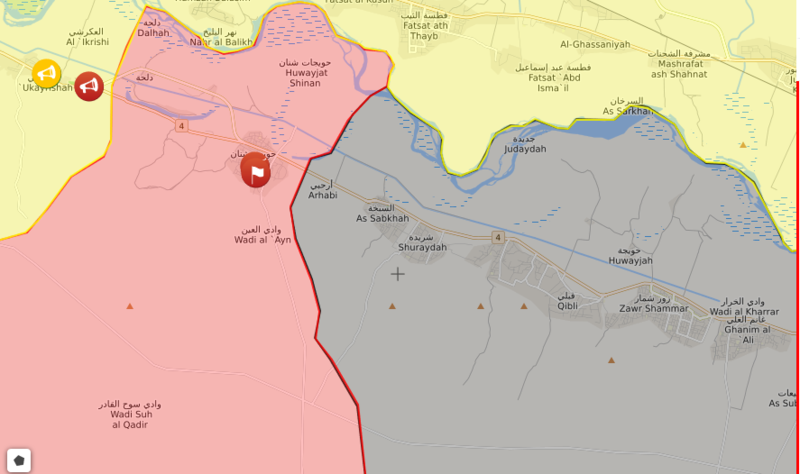 On Tuesday, The Syrian Arab Army (SAA) Tiger Forces and pro-government Tribal Forces liberated the village of Shinan near the Euphrates River in southern Raqqah. Earlier, government forces liberated the villages of Dalhah and Ukayrshah in the nearby area. 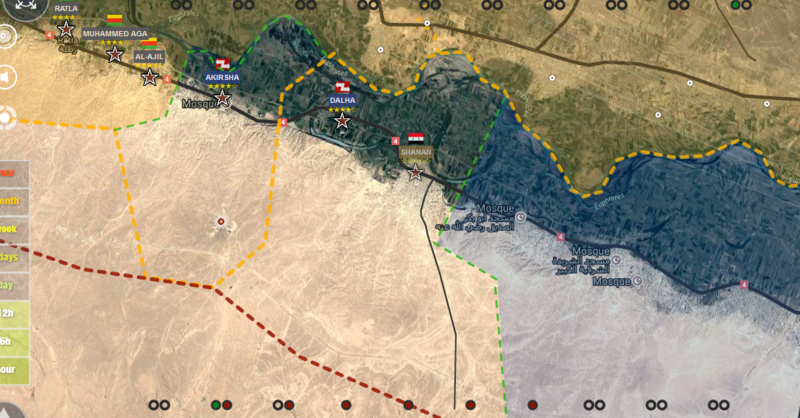 At the same time, reports appeared that the SAA and the Syrian Democratic Forces (SDF) made a deal dividing the spheres of influence in the provinces of Raqqah and Deir Ezzor on July 20. If reports are true, government forces have a wide field for actions against ISIS and expanding their sphere of influence along the Euphrates River. 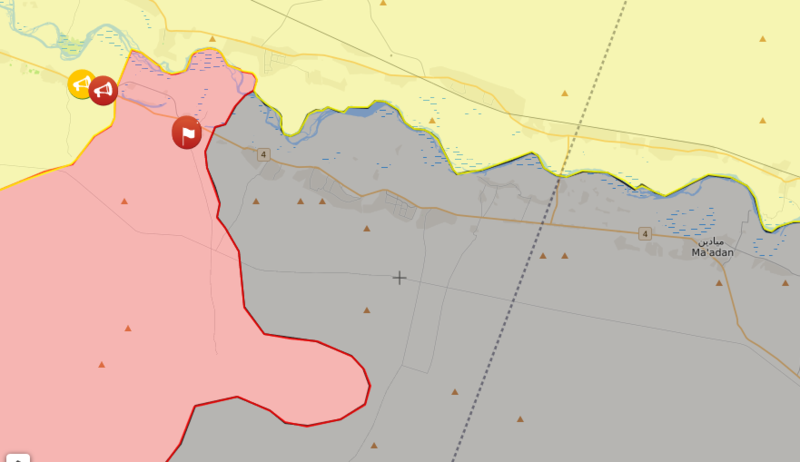 Good stuff, jihadi-map shows Ukayrishi as held by kurds, glad tribals have got it, many small villages on the way down the Euphrates, 7 or 8 just to Maardin, I wish them speed and good fortune on the way to Deir Ezzor. 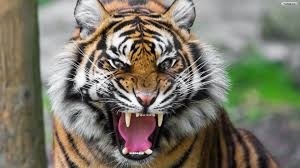 Yes, the ISIS resistance will increase when the Tigers, Tribals come nearer to DE City but there are nearly 10.000 Rep. Guards waiting to break out and hit ISIS where they can. Last number I read was 5500 on SF about 2 months ago. Not so easy for SAA to bring in new troops and keep them supplied. Mostly done by helicopter and supplies by parachute drop of large pallets, the airfield is still within ISUS arty and mortar range. Together with Hezb and tribal forces the RG are up to 10.000 men. there is 10 Thousand RG in DE? Together with Hezbollah and tribal fighters the RG are up to 10.000 men. hmmmm actually it makes sense to dump a lot of SAA troops there! They can break out East all of a sudden and capture the Gas and Oil fields! Many of the things reported by the SDF are generally false about gains , have heard them capture a village 3-4 times in a month. They are likely to be asked to leave those regions with the tribals forces already there defending and being pro-government supporters. Maybe this is why the US seem to be sending more and more troops every month! Stop listening to Fox they are not much better than CNN MSNBC in reporting facts either . Not Fox news. A twitter using the name Fox. Even those on Twitter can be wrong . I cannot vouch for the correctness of the report. If it is correct, it will be known within a day. IS top commander Abu Khamis is dead he was killed in a terrorist training camp with scores of others yesterday when the defenders went out on sorties on ISIS, a group of citizens attacked a group of IS at Bk-Omar crossing killing 9 and IS “emir” Abu Hamzeh was among the dead the Saudi terrorist responsible for the armament of Deir Ez zoir. Tweets report that people who back SDF kurds are “hypocrites”! Reports suggest this because of the niavity the Kurds have towards their backers (The US military and Saudi Arabia) and the history of the genocidal attack against the Kurds with the use of US supplied Chemical weapons that were supposed to be used against Iran! Reports suggest that anyone backing the “2 faced”, “sell our souls to the devil” Kurds are actually supporting the same empirialistic CUNTS who killed their ancestors! In a seperate report, supporters of the SDF are simply known as “Dumb Fucks”! It is impossible to believe any fox, cnn, cbs, bbc, ny times, washintong post new, if this one is not verified by another source. He admits this is just Twitter “news”. Perhaps he is upset that SAA is doing so well and wants to rain on the parade? Tweets report that the inferior SDF are begging SAA not to hurt them in the future! Reports suggest the SDF know the US will abandon them and give Turkey Chemical weapons to use against the Kurds in order to keep Turkey happy after the US fucked Turkey over! These reports come from the Highest levels of the YPG and their understanding of US sales of chemical Weapons in the past to their ally Saddam Hussein! Its a different topic I know but has the Syrian pilot shot down by the yanks a few weeks ago and detained by the SDF been released yet ? SDF treats their POW’s very humane and decently. The pilot is very lucky to have avoided falling into the hands of Turcoman Daesh Jihadists. They are savages. Look at what they did to the Russian pilot captured by Turcoman Jihadists. Chop, chop, chop off with the head, with their stupidly blunt knives. SAA should ask SDF to vacate south of river including tabqa and raqqa for any meaningful cooperation. It seems You need to go back to school. Raqqa is north of the river. By the way, Your suggestion would involve the Americans. It would give the Worlds last remaining superpower (the Americans) a perfect excuse to take over the rest of the country. They will then be in a position of rightfully claiming self-defence. So, don’t play with fire. However, I suspect the regime in Damascus are much too wise, to give the western powers such an excellent excuse to counterattack. Well, so far there have been a massive desertion from the SAA so far. At least, until early 2017. Where do You think the millions of young men fleeing from SAA comes from? Who wanna fight for a dictator? This have forced the SAA to rely heavily on foreign aid from Russia, Iranian revolutionary guards, Hizbul’lah etc. Fact is, the SAA has become almost as “foreign” as the Daesh. At least, this is what the situation was like before easter, early this spring (1. March 2017). Many soldiers I know, they fight for their fatherland and they love their president. As President Assad is overlooked, he is not. So, Syrians report it to people I personally know. This is a lie who says President Assad is a dictator. A political system where somebody inherit their position from their father (or some other elderly senior relatives) is Monarhistic. So, Bashar al-Assad has all the hallmarks of beeing a Monarch. In addition, the Monarchy in Syria seems to be autocratic. Just take a look at their so-called Parliament. Hardly any real opposition parties at all. By the way, just wait a few years after the naive gullable soldiers of SAA has given away power back into the hands of Assad again. Then worrying reports about violation of human rights are going to appear again. And refugèes are going to start leaving Syria again. The truth wlll catch up with a blinded world. Just give it time. Excellent news, congratulation to Russia-Syria-Iran-hezbolah fighter. Now, do not stop please, go along the Euphrates riven until Dary az Zawr (Deir Ezzor) is reached, cross the riven and go west to Iraq border !! That will stop USA ambitions in the area. Not necessary to pledge for the obvious. The SAA are already on their way to relieve their besieged brothers in arms in Deir Azzor. They even have made a deal with the SDF to secure free passage on their way to Deir Azzor. This is a fact. Like it or not. Syria-Russia-Iran-Hezbolah cross Euphrates river and Go East to the Iraq border.! that is what I wanted to say, sorry.